In terms of the tech world I’m an old geezer. I actually remember the days of monochrome screens, both the amber and green kind. I even have my old Commodore 64 with its light blue font on dark blue background. So I was feeling a bit nostalgic, and decided to create some shortcuts to PowerShell windows with a retro look. Right click on it, pick “Send To”, then “Desktop (create shortcut)”. 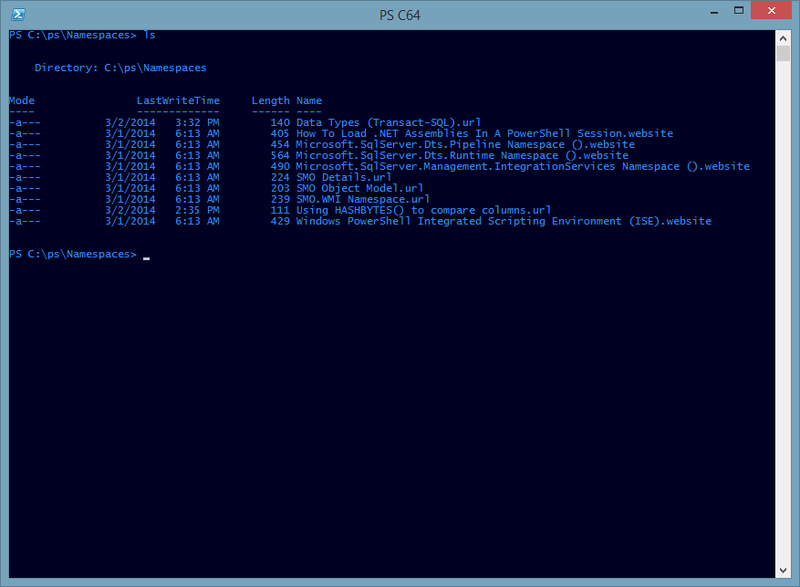 If you are on Windows 8, the simplest thing is to go to your start menu and locate Windows PowerShell. Pin it to your task bar. Now, desktop taskbar shift + right click (the shift is very important when you right click) and do the same Send To / Desktop I mention above. OK, you now have a short cut, let’s start our retroization. First, give it a decent name. 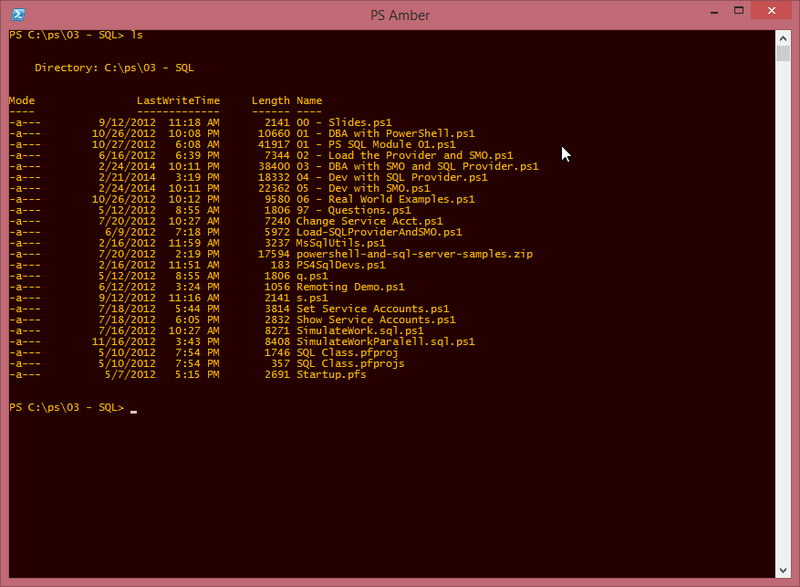 For my example I’ll pick “PS Amber”. Next, right click on it and pick Properties. 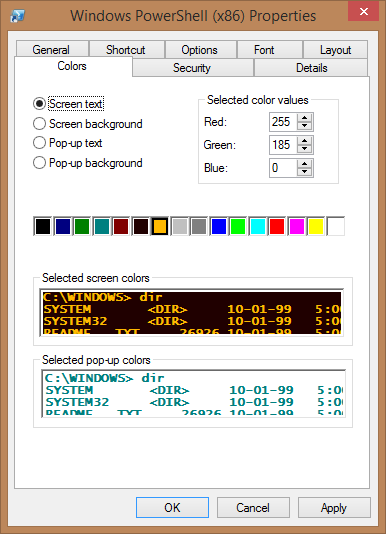 In the dialog click on the Colors tab. Click on Screen Text, and set the Red / Green / Blue to 255, 185, 0 respectively. Now, this is the part that will bring back the cool “retro” effect. If you are an old geezer like me, you’ll recall the amber monitors also had a big of an orangey background, they weren’t entirely black. Go to the Screen Background, and set its Red value to 32, then use 0 for Green and Blue. That will give it just the hint of orangeness to make it authentic. Of course based on your monitor calibration you may need to tweak it up or down just a tad, adjust until you are happy. 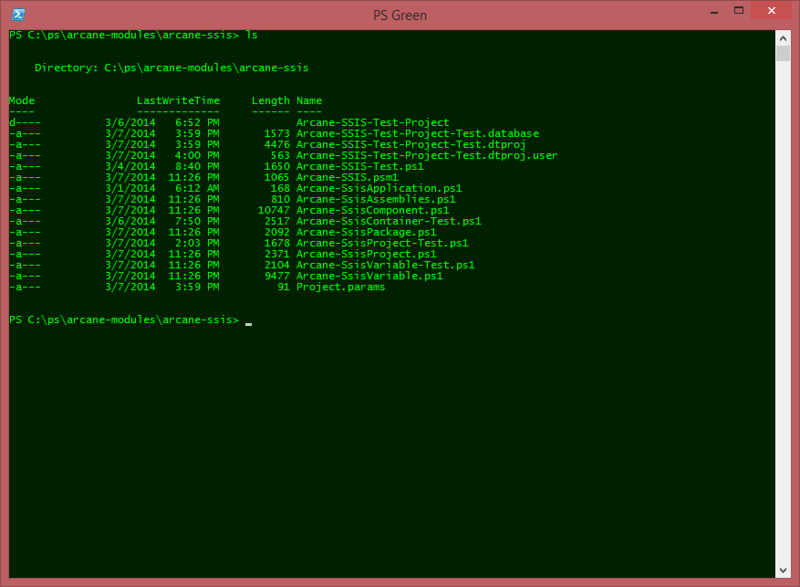 Following the same steps above, I created a second short cut called PS Green. I set its Screen Text to an RGB of 0, 255, 0, and the Screen Background to 0, 32, 0. Like with the previous section, I used the reverse colors for the pop ups, 0,255,0 for the background and 0, 32, 0 for the popup text. Setting up different shortcuts to different color themes can not only make you feel nostalgic, but it can also be quite beneficial when you have multiple PowerShell windows open at the same time. The drastically different colors can make it easy to know which window you have doing what task. Have fun with it, adjust the colors until they look just right on your own monitor, then create your own crazy color combos. If the are really good post them in the comments area. If I get enough I’ll create a follow up post, giving appropriate credit for each submission.